What will it take so that there is an equitable distribution of males and females in leadership roles of our Fortune 500 companies? 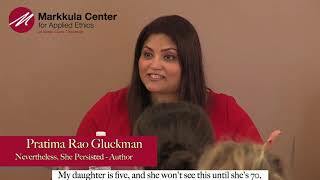 Pratima Rao Gluckman’s Getting to 50/50 podcasts seeks answers to these questions and more. Thought-provoking interviews, insights, book reviews and more are featured in these podcasts to discuss the changes we can all make to help bridge the gender gap at the very top and throughout our society. There are two consistent lessons. First, persist. Regardless of what society expects of you or tells you to do, persist with your own vision of what you want to achieve in your life. The tailwinds of persistence will help you soar. The second lesson is that we all have the power to change the world for someone else. If each one of us makes it a point to intervene in one woman’s life, we can get there, slowly but surely—one woman at a time. My long-term hope for the tech world is to have equal representation of men and women as CEOs, board members, executive leaders, middle managers, and engineers. I hope that by telling these women’s stories, I will encourage new generations of women to develop the skills and determination to make this a reality. Let’s go change the world. 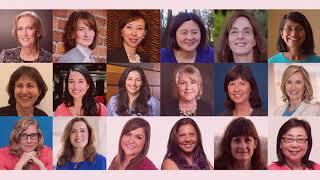 ​It is no secret that the technical world is a male-dominated space. From the cultural belief that Computer Science is a “subject for boys”, to the assumptions and discrimination women experience in the field, it can be challenging for women at every stage to thrive in tech careers. Nevertheless, some high-performing women persist and succeed as leaders in tech despite the gender biases pitted against them. Pratima Rao Gluckman—a female leader in tech herself—embarked on a project to collect stories of the leadership journeys of such women. Pratima Rao Gluckman knew she wanted to be an engineer from a young age. When she took her first programming class, she fell in love and began on her career path. She attained a Masters in Computer Science (University of Texas at Arlington), Masters in Chemistry and Bachelors in Instrumentation Engineering (BITs Pilani India). After a few years working in the industry as a software engineer, she made the decision to move into engineering management. Leading came naturally for her, and currently, in her field of enterprise software, she is Engineering Leader at VMware and manages a team of engineers. Pratima was featured on "So Booking Cool"
Pratima Rao Gluckman, Orna Berryman, and Erica Lockheimer, three women directors from large Silicon Valley technology companies, share their experience as speakers at the event: “Nevertheless She Persisted-Women in Tech.” The event was sponsored by the Markkula Center for Applied Ethics and held on Jan. 19 at Santa Clara University. At the event, the speakers shared their life stories in their journeys to success, and encouraged young aspiring women to join the field of tech. A senior business student at SCU’s Leavey School of Business was also interviewed about how the event will help her prepare for her career.